Use of VCSELs in fiber optical communications created a steadily growing market opportunity for suppliers of these products in 1990’s. More than 30 million VCSELs were sold in 2016 for applications in optical transceivers, including high speed 40GbE and 100GbE modules. 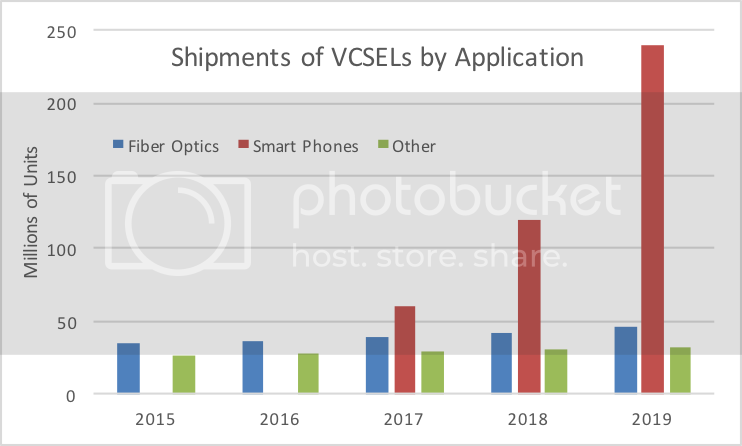 This market segment for VCSELs is projected to grow in 2017-2022 despite increasing competition with edge emitting lasers and Silicon Photonics based devices. The low cost and low power consumption of VCSELs will be hard to beat. Manufacturers will continue to improve the performance of VCSELs at higher speeds and extend the reach of multi-mode fiber connections powered by these devices. The total number of VCSELs sold into various end-markets over the last two decades is estimated to be around 1 billion units. Oclaro announced their 100 millionth VCSEL shipped in 2011, Finisar reported their 150 millionth VCSEL shipped in 2013, and II-VI reported their 200 millionth VCSEL shipped in the same year. Philips Photonics reported their 100 millionth VCSEL in 2014. Tens of millions of VCSELs sold every year for applications in laser-controlled computer mice and gaming consoles. Smaller form-factors, larger wafer sizes, and manufacturing automation improved yields which enabled lower product costs and improved market penetration. Potential application of VCSELs in smart phones offers a much higher volume opportunity for suppliers, as illustrated in the figure below, dwarfing all other applications.